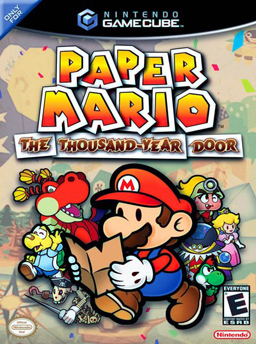 Paper Mario: The Thousand Year Door (TTYD from here on out) was a Gamecube sequel to the popular Paper Mario 64 released in 2001 on Nintendo 64. The original had an intriguing storyline, witty writing, and an involved battle system that sparked large fanfare for the series. Nintendo released TTYD on Gamecube a few years later and improved on every aspect of the game. TTYD was truly a long and epic game, filled with side quests, memorable characters, excellent writing, and one of the best battle systems I’ve seen in an RPG. This game ate up many hours of my time, and Paper Mario fans still claim this to be one of the best Mario games of all time. The premise of the story is similar to the original Paper Mario, and its predecessor Super Mario RPG. Mario has to collect 7 star pieces to essentially thwart the plans of an evil mastermind. Some may say the idea has been recycled twice, but Nintendo manages to make each quest and story completely different from the last. In this installment there is a Thousand Year Door which is sealed underneath the main hub of the game called Rogueport. 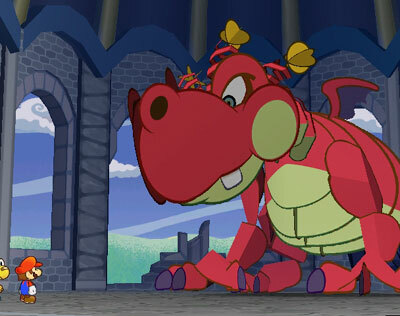 Without getting into detail of the story, the star pieces are key to the Thousand Year Door, which is essential to the plot and plans of the evil mastermind. Paper Mario has always had humorous writing, brimming with one-liners and eccentric characters. The writers certainly stayed on board with that formula as players met some of the most bizarre characters in the Mario universe. Players were faced with a whodunnit later on in the game, and took part in a gladiator style tournament during one of the story arcs. This game will always have a special spot in my heart of hearts, and I’m still waiting for a proper sequel. The 3DS Paper Mario game slated for August probably wont satisfy my craving for a new Paper Mario game.